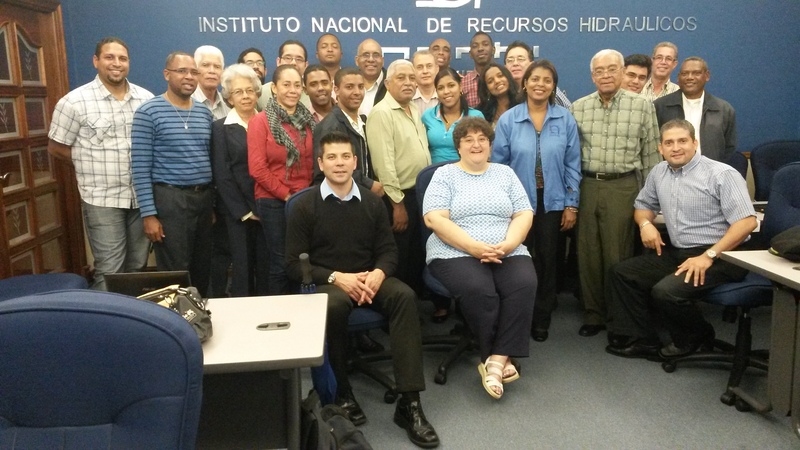 On 12-16 May 2014, two hydrologists from the USACE Hydrologic Engineering Center (HEC), on behalf of ICIWaRM, conducted a five day training course and workshop at the National Institute of Water Resources (INDRHI), Santo Domingo, Dominican Republic. The course was co-organized and co-sponsored by INDRHI and its UNESCO-affiliated Centre for the Sustainable Management of Water Resources in the Caribbean Island States (CEHICA). USAID also sponsored the event. The primary objective of this training effort was to build capacity within the Government of Dominican Republic (GoDR) for integrated water resources management and planning, and specifically its capability to do reservoir system studies using computer simulation to analyze reservoir system performance. The ~30 attendees were mostly from INDRHI, but also included water professionals from the Bahamas, St. Lucia, and Trinidad/Tobago. Chan Modini, Chief of the Water Management Systems Division of USACE’s Hydrologic Engineering Center (HEC), and Joan Klipsch, Senior Hydraulic Engineer and lead for HEC-ResSim, led the Reservoir Simulation training. In addition to four days of reservoir modeling and simulation training, one day was set aside for applied model development and discussion. Class participants will be able to apply their training to models being developed for basins such as the Yaque del Sur. The Yaque Del Sur basin has two multi-purpose reservoirs and an associated, extensively developed irrigation system. The $400 million Monte Grande Dam is also planned in the basin. The Director of CEHICA, Juan Chalas, noted that “This event was achieved through many combined efforts…given that the course was necessary for the region in order to simulate/manage reservoirs for extreme meteorological events. As next month’s hurricane season begins, this course came as a ‘natural fit’ as it has a tool for such purposes.” A follow-up course on hydraulic modeling is tentatively planned. Figure. Instructors and participants in the RESSIM training course.